Rafael Nadal has pulled out of the Aegon Championships at Queen's Club because of the wrist injury that forced him to withdraw from the French Open. Nadal said he feared he could tear a tendon if he played at Queen's, which starts in London on 13 June - a fortnight before Wimbledon begins. The Spaniard, 29, added: "I enjoy playing in front of the British people and I was looking forward to trying to win the title for a second time." 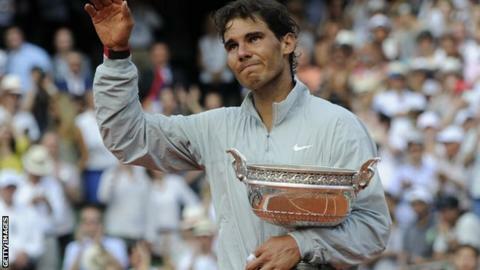 Nadal hopes to play at Wimbledon. The 14-time Grand Slam champion won at Queen's in 2008 and was Wimbledon champion in 2008 and 2010. He was unable to defend his Wimbledon title in 2009 because of tendinitis in his knees and the 2008 Beijing Olympics gold medallist also missed London 2012 because of injury.